When it comes to selling a home everyone wants to get near asking price and for it to happen quickly. To do this effectively, it can be invaluable to use the advice of some professionals that know the ins and outs of real estate. So sit back and check out the five tips that helped us sell our house in 7 days! It isn’t enough to have a “picked up” house when showing. It needs to be immaculate. This also includes making any necessary repairs: patch nail holes, replace lightbulbs, paint touch-ups, caulking and yard work (check out my yard makeover here.) There are all kinds of FREE tools available to make sure you don’t miss anything when it comes to the deep cleaning. Not to mention a checklist to use before every showing. Most homes are filled with personal effects: family photos, cute kiddo artwork, flower arrangements/wreaths, pet beds/dishes and specific decor. While these things are just fine for daily living, you want the house to feel and show like a model home. The people coming to walk through need to see themselves living in your house and that can be hard to do with so many distractions. You may think it won’t feel warm and inviting trust me, less is more works! Staging is NOT simply arranging furniture so it looks the best in the house. Its making your house look current and also to make the house look uniform. This includes painting and sometimes getting new furniture. From my personal experience: When we finished our basement we wanted it to be bright and fun, so we painted it a bright green. That was five years ago when it was a really trendy color. After hiring an interior designer to help get my house market ready, her first suggestion was repainting the basement. It was really hard for us because we LOVED the color. Nevertheless, I took her advice and painted it anyway. I think 99% of you would agree that it was for the best. I agree now that its over, its WAY better. If you are like most people about to list your home, you’ll probably have a realtor come take the pictures (probably on their cell phone) and those images will go untouched right onto your listing. Here are three cell phone vs. photographer images to illustrate why spending a little money initially can make a huge difference to potential walk-throughs and eventually buyers. I rest my case. Thank you Jason McGrew Photography! Get your home on as many websites as possible. Realtor.com, Zillow.com, Trulia.com, Craigslist and Real Estate websites can help get more hits on your listing. Try getting friends involved by posting on Facebook, Twitter, Instagram and other social media sites. 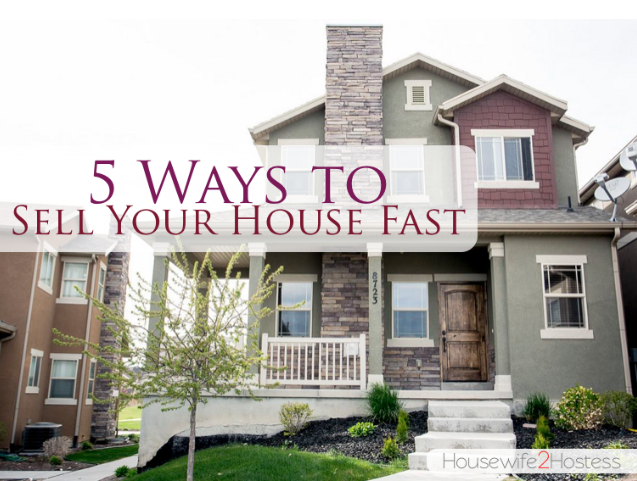 I hope these tips were helpful for you and I would love to hear what tips and tricks have helped you sell your house fast! PLEASE NOTE: My opinions are based on my personal experience and may not be typical. FAB post! Wow, your house looks spectacular. You really went above and beyond to make it look amazing for selling and it totally paid off. Thank you! Its been hard but VERY worth it!